KCMB Kansas City News: Who Will The Chiefs Target In Free Agency? Who Will The Chiefs Target In Free Agency? Now that the NFL lockout is officially over, the Kansas City Chiefs can focus on the 2011 season. Today marks the beginning of what will likely be the wildest free agency period in the history of the league. Kansas City has money to spend and some glaring holes on the roster, which means the Chiefs will likely be a big player in this year's free agency period. Kansas City enjoyed a remarkable turnaround on defense last season, and the team's new 3-4 scheme under Romeo Crennel proved to be a success. At the heart of every good 3-4 defense is a top-notch nose tackle, and Kansas City is still in search of someone who fits this bill. 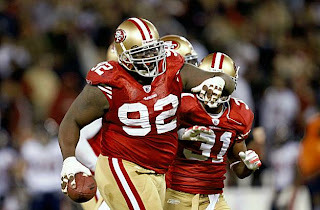 One name floating around is San Francisco's Aubrayo Franklin, who has proven to be a top NT and should be affordable. The Chiefs could also use some help at inside linebacker, and the team may try to sign someone to team up with the playmaking Derrick Johnson. There have been rumors that Kansas City is trying to aquire former pro bowl linebacker Nick Barnett, who has lost his spot in Green Bay. Barnett has battled injuries over the past several seasons and is getting older, but the veteran could give the Chiefs' young defense a boost. Offensively, the team still needs some help at receiver. Despite drafting Jonathan Baldwin in the first round, Kansas City is still dangerously thin at WR and could use a speedster to help open up the offense. There are several wide receivers on the market that Kansas City could take a look at, although it appears unlikely that the team will take a chance on one of the more high-profile players available. Overall, expect Kansas City to address NT, which is the most pressing position of need this offseason. The Chiefs have money to spend and there is a lot of talent on the market, and the team knows it is still a few players short of being a consistent winner.